Rose McKinney-James is a contributor to Writers on the Range, the opinion service of High Country News. She is the managing principal of Energy Works LLC, a public policy and advocacy firm based in Las Vegas, Nevada, and is also board chair for the American Association for Blacks in Energy. When the Trump administration initiated an “energy dominance” agenda one year ago, it did so under the premise that removing barriers to oil and gas development on public lands would “bring true prosperity and wealth to our people.” It was an empty promise. In reality, this approach opened the doors to increased pollution, greater restrictions on access to public lands and damage to vital wildlife habitat. What benefited was the bottom line of a few private oil and gas companies. The emphasis on developing oil and gas on public lands also reduced opportunities for developing clean energy resources. The Crescent Dunes Solar Thermal Facility, located on BLM land near Tonapah, Nevada. As a former commissioner with the Nevada Public Utility Commission, I’ve seen the success that happens when there’s collaborative development of renewable energy on public lands. Here in Nevada, the Dry Lake Solar Energy Zone outside of Las Vegas is now home to 179 megawatts of solar projects on public lands, with more on the way, thanks to the leadership of the Bureau of Land Management, former Nevada Democratic Sen. Harry Reid, developers like First Solar and Invenergy, and conservation groups that saw the twin needs to accelerate the transition to renewable energy and protect public lands. 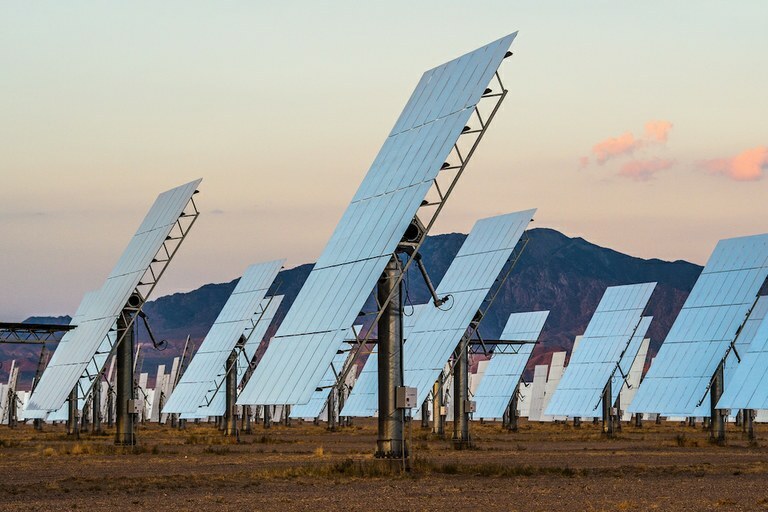 Utility-scale solar projects are big — the two projects in the Dry Lake zone cover the equivalent of 1,360 NFL football fields — so finding the right places for them is important. To do that, the BLM collaborates with regulators, developers and other stakeholders, looking for lower-conflict areas that are near existing roads and transmission lines. The Dry Lake zone, for example, is surrounded by multiple transmission lines, several solar and natural gas power plants, mining operations, a landfill, several major highways and a railroad. So far, there are 19 solar-energy zones in six Southwestern states that, together with other designated renewable energy zones, encompass 700,000 acres. To date, the Dry Lake solar projects have created 1,300 jobs and produced enough clean energy to meet the consumption needs of 46,000 homes; that much energy is equivalent to the emissions you’d save if you took nearly 52,000 cars off the road. In Nevada, the BLM is now looking to expand this solar zone and identify others in the southern part of the state, giving residents hope that this kind of smart planning for renewables will continue despite the Trump administration’s desire to cut the agency’s budget for renewable energy in half. When it comes to oil and gas development, however, the administration is moving away from collaborative processes that allow for public involvement. Though the oil and gas industry is already sitting on nearly 8,000 unused drilling permits, tying up 14 million acres that would otherwise be available for multiple uses, the administration has attempted to allow private oil and gas companies to develop an additional 11.6 million acres of public lands. Some are close to national parks and within sensitive wildlife habitats and culturally significant landscapes. Furthermore, in removing critical land-use planning regulations and cutting the public out of the decision-making process, the administration is ignoring its obligation to operate with transparency and promote balanced management of public lands. To be clear, I am not suggesting we eliminate oil and gas development. This is about ensuring the smart and inclusive decision-making we expect when it comes to major changes on our public lands. Elevating fossil-fuel development on public lands above any other activity hinders the significant progress we’ve made in improving air and water quality, and it significantly contributes to the greenhouse gases already warming our planet. The United States has it backwards these days when it fails to focus on renewable energy development. Despite the administration’s efforts to cut renewable funding in half and prioritize special interests, the market tells all. Demand for fossil fuels continues to decline, while renewable energy production is climbing. Job growth in the clean energy industry is at a record high, with solar jobs now outnumbering jobs in natural gas. That is why I recently traveled to Washington, D.C., to join a diverse panel of Westerners who asked Congress to restore public involvement in the decision-making process for energy development on public lands. This administration needs to involve the public more, not less, ensuring that local communities and constituencies are consulted and engaged early in the process. And it needs to increase transparency and accountability. Public lands are owned by all Americans and should benefit all of us — not just a handful of special interests. Let’s put the “public” back in public lands.